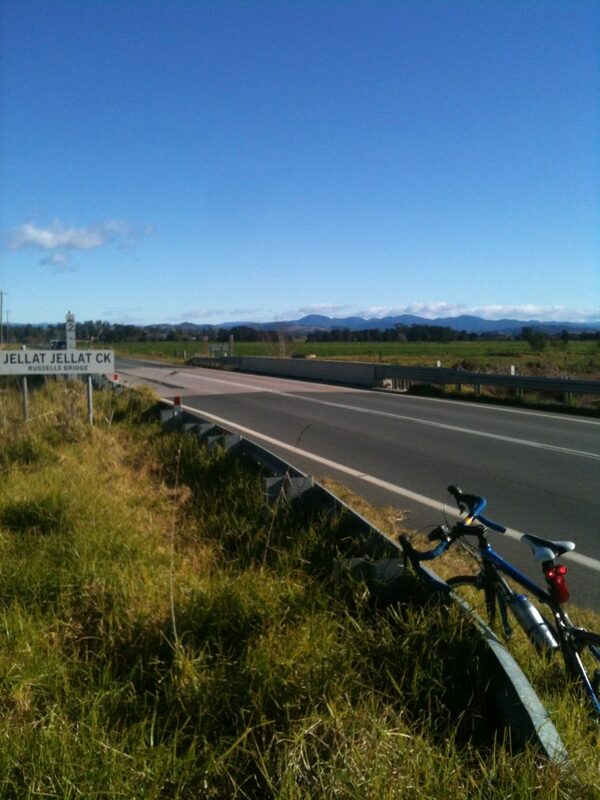 Brilliant blue skies will sparkle alongside community spirit this Sunday (September 30) for the Bega Tathra Safe Ride – NSW Bike Week Community Ride. The bushfire that destroyed so much just six months ago is inspiring many to take part, not just to raise money for the Mayor’s Tathra and District Bushfire Appeal, but more so as a celebration of people and place. The 65 families who lost their home in the fires of March 18 get to ride free. “We know that many people are still struggling with their grief and the task ahead, we really hope this is a day that will lift them up and push them forward,” says Robert Hartemink, ‘Lead Rider’ of the Bega Tathra Safe Ride Committee. Ingrid Mitchell and Deb Nave and their sons Malakai (8 years) and Torren (4 years) are riding on Sunday, and are looking forward to reconnecting with people since losing their home on Bayview Drive. 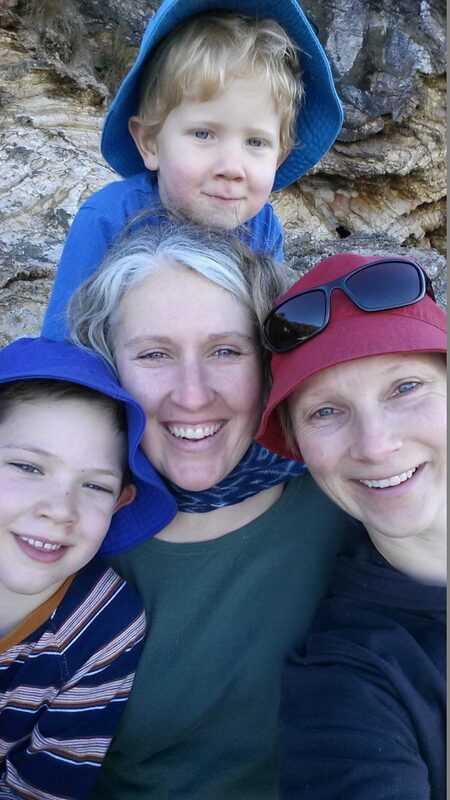 “This Bega – Tathra bike ride is the first time I feel our family has had the opportunity to enjoy bike riding together and had the head space to do it since the fires,” Ingrid says. “We have spent most of the last six months not living in Tathra because we have been house sitting. “What we have missed is being able to walk on the beach, see friends easily and catching up with people at the skate park. “The ride will be a challenge to us physically but so much fun with a big crowd, I hope there will be hundreds of people there to celebrate the resilience of the people of Bega valley and help fundraise to get a bike path all the way between Bega and Tathra,” Ingrid says. The Nave – Mitchell Family, Torren (at the top), Malakai, Deb, and Ingrid. Photo: Supplied. Aside from contributing to the Mayor’s appeal funds from the day will also go towards the grand vision of a dedicated track that covers the 16km between the two towns. Funding for stage one between Tathra and Kalaru is secure thanks to a $3 million grant from the NSW Government the other 12km remain largely penniless. “We so want the bike track to succeed all the way to Bega for the whole Bega Valley community and visiting tourists,” Ingrid says. 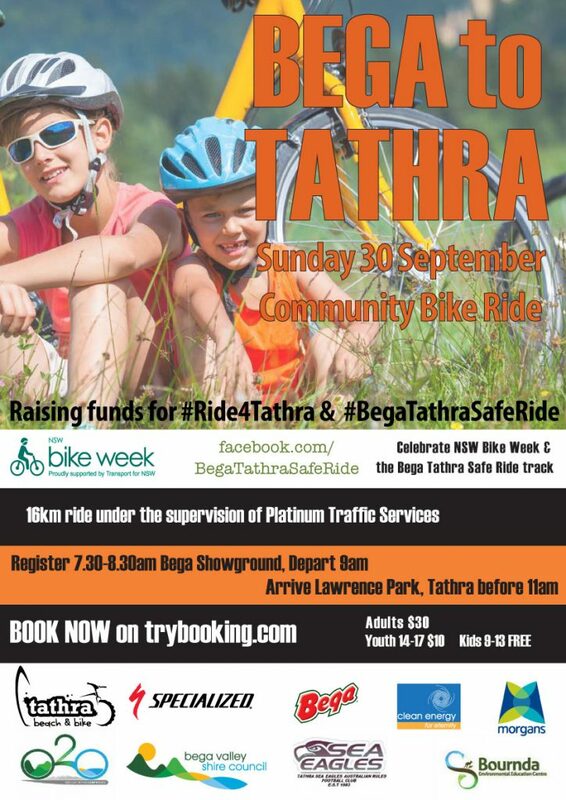 Leaving Bega Showground at 9 am this Sunday (September 30) the Bega Tathra Safe Ride – NSW Bike Week Community Ride, will head for Lawrence Park Tathra. The inaugural ride 12 months ago saw around 270 riders of all abilities peddle between the two towns, experiencing what a dedicated bike track linking coast and country landscapes could be like. In the meantime, and for one day only, rolling road closures managed by Platinum Traffic Services will give riders a chance to enjoy the journey without the normal pressure of cars and trucks. Traffic along the Bega – Tathra Road might experience some delays, however, ride organisers are aiming to keep hold-ups to a minimum while the roadway is shared over a two hour period. The day starts with breakfast at Bega Showground from 7:15 am, with registration from 7:30 am – 8:30 am, followed by the Welcome to Country and briefing before riders set off together at 9 am. Riders are expected to arrive at the Tathra finish line before 11 am. The event will conclude at 11:30 am after the Lucky Rider Prize is drawn. Tathra Beach & Bike have chipped in with a $500 voucher for the purchase of ‘Specialized’ gear from their store. All riders will be in the draw to win. After the event has finished, riders will be invited to stay on for brunch and to join in community activities organised by Tathra Sea Eagles AFL and Clean Energy for Eternity. “It’s the community in Tathra, Bega and beyond that has helped with the ongoing strain of losing our house, we are looking forward to riding with them and enjoying our beautiful region on Sunday,” Ingrid says. There’s more information about Sunday’s community bike ride on the Event Website and the Bega Tathra Safe Ride Facebook page including a link to TryBooking.com for registrations ahead of the day. Ingrid, Deb and their boys are hoping to settle back in Tathra as soon as they can, and are keeping their options open in the meantime. Sponsors include: NSW Bike Week, Transport NSW, Bega Cheese, Bega Valley Shire Council, Morgans Financial Services, Tathra Beach & Bike, Bournda Environmental Education Centre, Specialised, Clean Energy for Eternity, Tathra Sea Eagles AFL, Platinum Traffic Services, Lantern Heritage, On The Perch Bird Park, Bega Showground Committee, Tathra Beach Country Club, Bega Valley Medical Practice, and About Regional.